One third of all festivalgoers leave a music festival early because the music is too loud. This according to research conducted by the Dutch National Hearing Foundation. Seven out of ten people come home from a festival with a ringing in their ears. According to the Hearing Foundation, this number is huge. Music at festivals in The Netherlands is not allowed to be louder than 103 dB. In addition to this, Dutch music venues agreed to provide information about and sell good hearing protection. But all sounds louder then 85 dB are harmful to the hearing. And in the end, festivalgoers decide for themselves wether or not they want to wear hearing protection. The Crescendo Dance would be a very good choice to wear to music festivals. 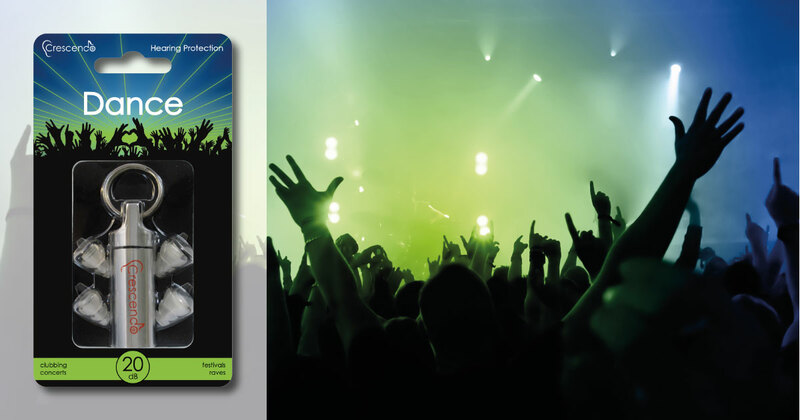 The universal fit earplugs are specifically designed by Dynamic Ear Company for listening to loud music for several hours and give a protection of 20dB, reducing festival music to safe listening levels. In addition to this, the Dance filters provide a natural sound and preserve speech intelligibility, providing maximum enjoyment without damaging the hearing. Wondering how it sounds? Click here to listen.